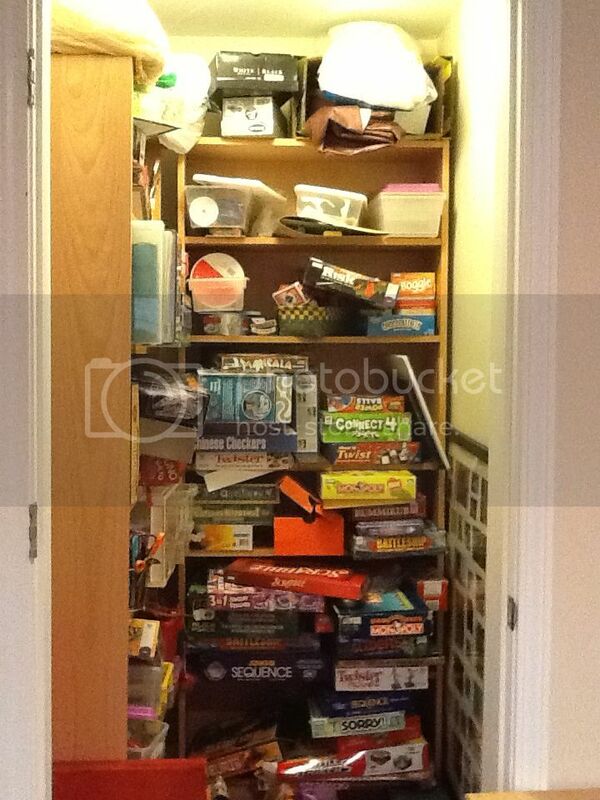 We had a motley mess of a game room closet in our family room for a while! That needed to change! When we finished the basement family room, we used shelving cabinets that we already had, just to get by. Definitely a lot of wasted space and well, it looked horrible! There was NO staging to make that look worse! That was really what it looked like! ARG! 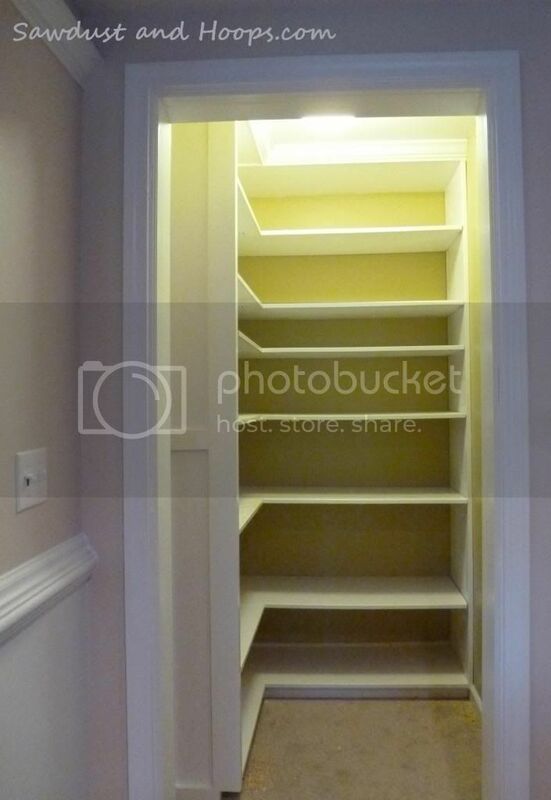 For those of you who love to read the end of book first, here is the final result!…..
Built-in closet shelving with adjustable shelves topped with crown molding! 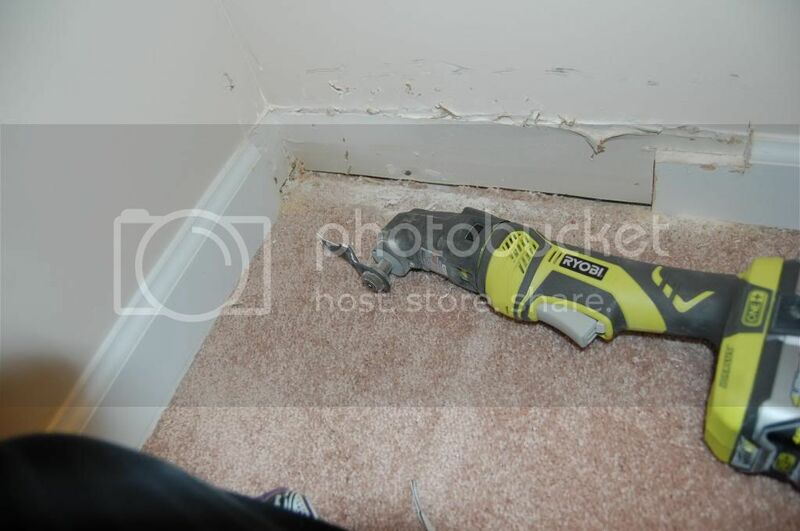 We were thrown a challenge when the contractor finished the basement. He forgot to put in a return for the HVAC! We completed the basement in two phases for financial reasons. The first phase was the living space and the second phase was installation of the HVAC unit. Unfortunately, we didn’t even realize the return was missing until the HVAC company told us! The only real option we had was to put a return vent in the game closet which is next to the HVAC closet. 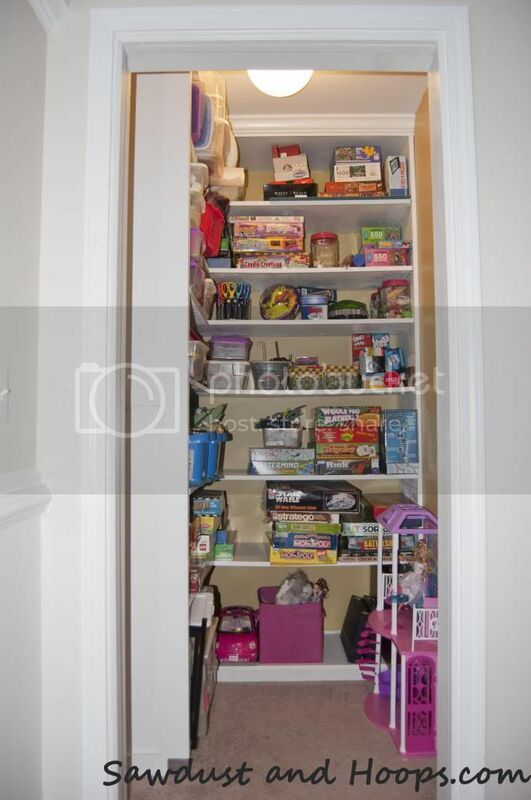 This meant we could not have a normal door on the game closet since it creates a vacuum in the closet. No fun until a room implodes, I suppose? NOT! 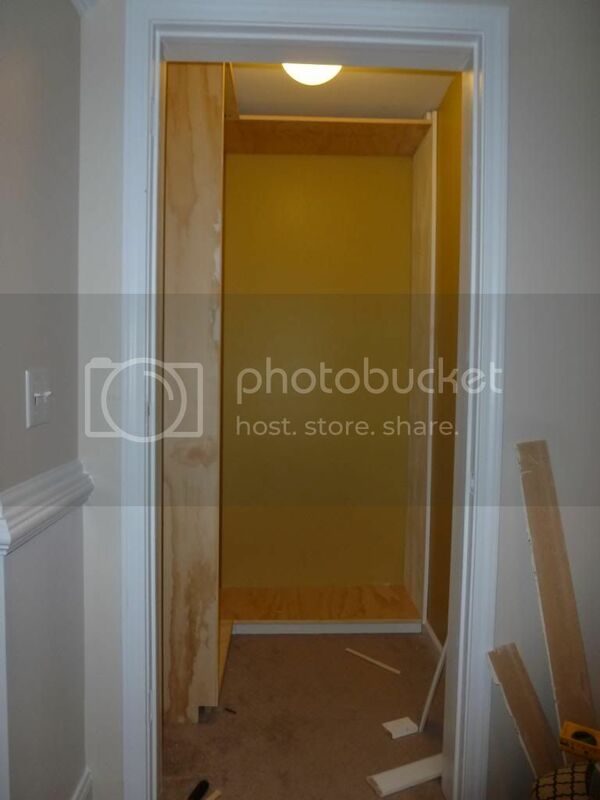 So, we needed to remove the door. I did price louvered interior doors which would have allowed a door to be used, but I could not find one that I could justify buying. And, that option would not fix the poor use of the space. 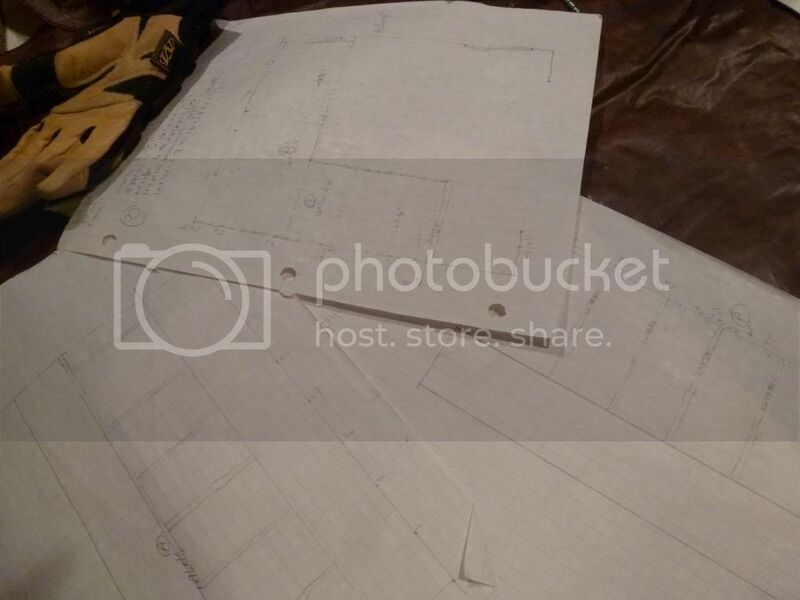 I always start my projects with old school graph paper. I designed a few options and decided to fix the eyesore the closet had become! I always start my projects with old school graph paper. In my design, there are 3 vertical panels. One on each side of the back wall and one on the left side of the left wall. There will be adjustable L-shaped shelves. The L-shaped shelves will be joined with a “fixed joint”. Starting with the back wall, I cut out the baseboard. 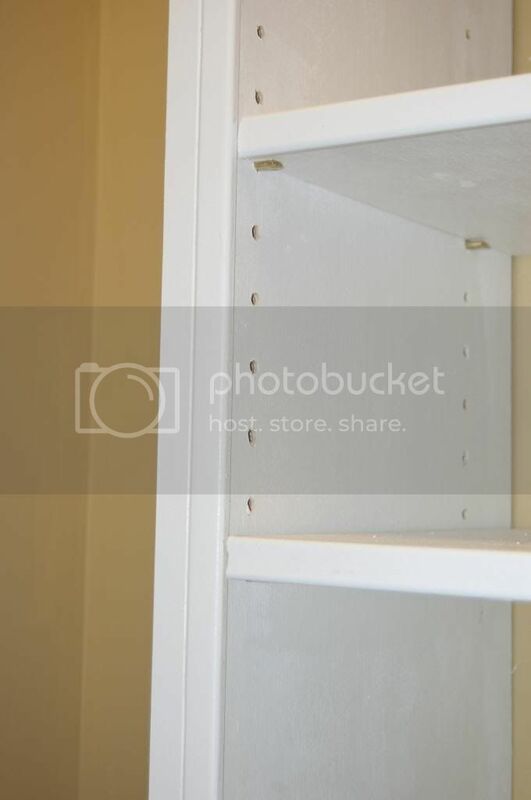 I wanted a kick plate under the bottom shelf, so I notched out the vertical sections. I chose 3″ high and about 3″ deep for the kick plate. I should have used my jigsaw for this cut, but the multi-tool worked fine. 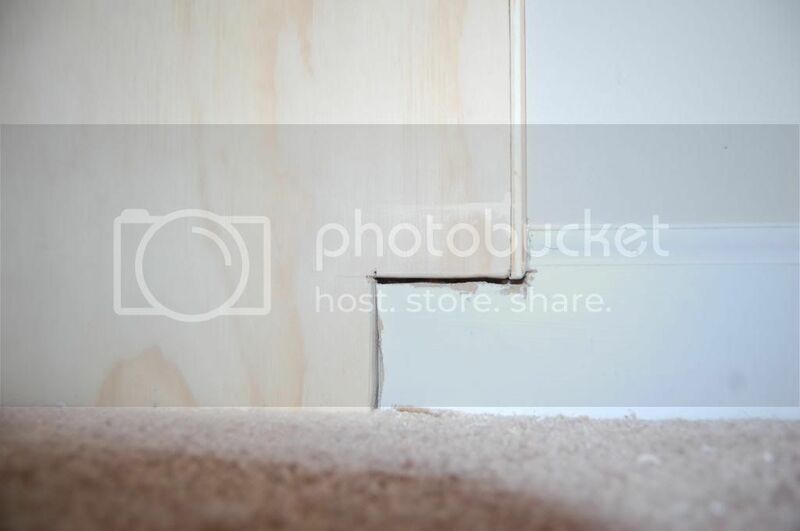 A perfect fit for the cut baseboard! 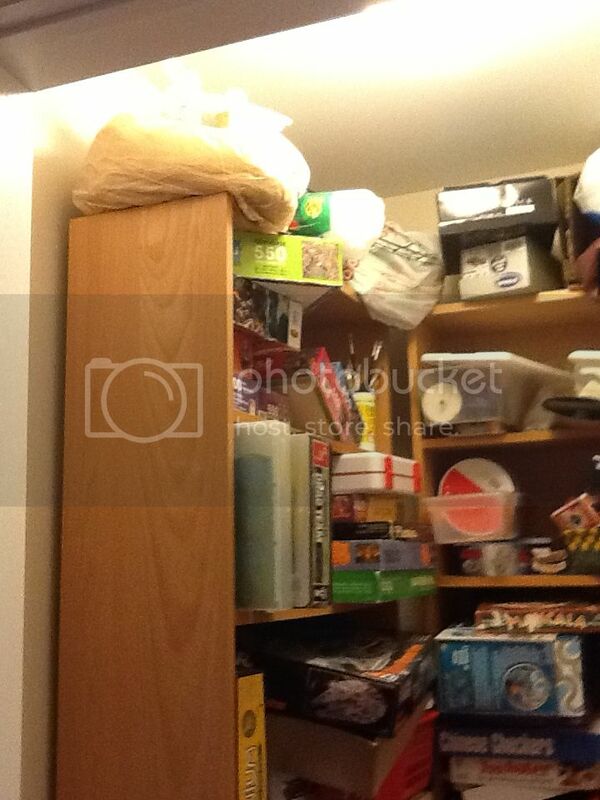 My initial design was to use 16″ deep shelves on both the left wall and the back wall. But, when I put the front vertical panel in place (the left side of the left wall), it looked so wrong. When you looked into the closet, your eye went straight to the side panel. 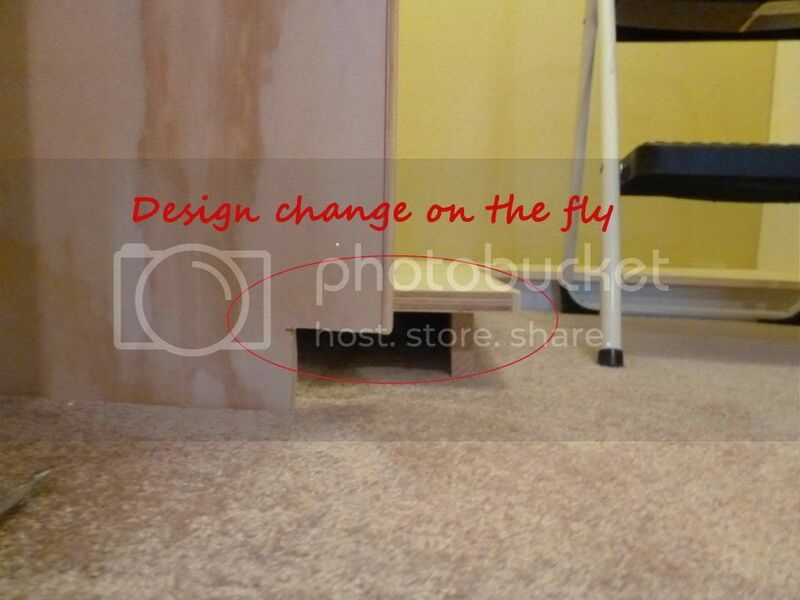 So, design change on the fly….. In the next photo, you see the updated depth of the left wall panel at 12″. I left the bottom shelf in place for this photo so you can see the difference. 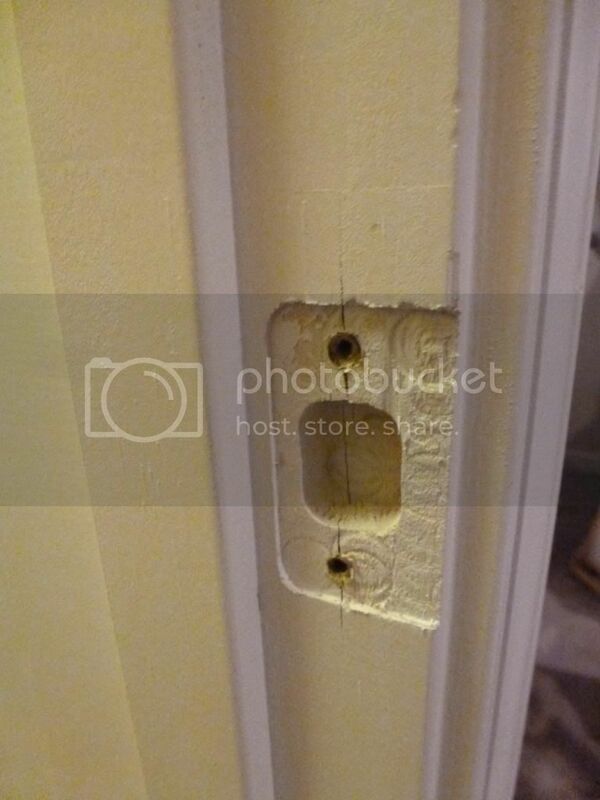 16″ was just too deep for the left wall. To trim that vertical panel, I ripped the panel down to 12″. 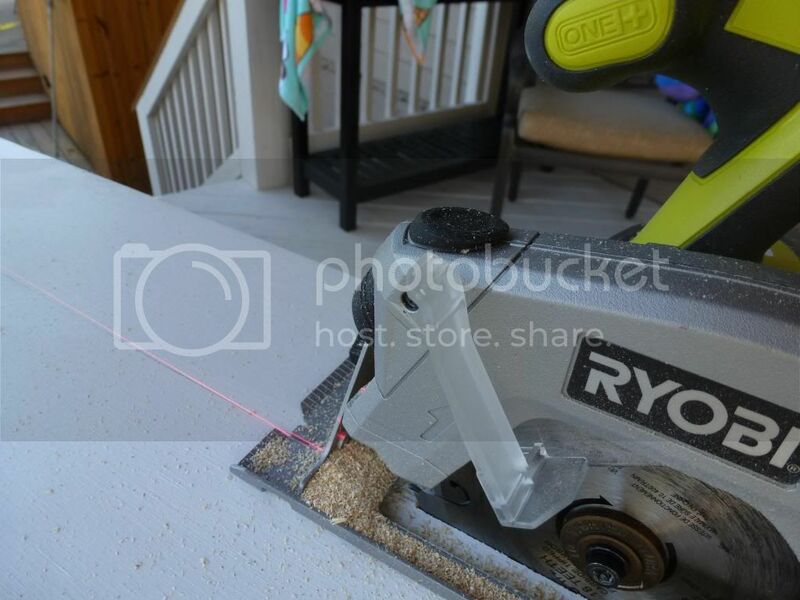 I LOVE the laser on the Ryobi saw! It made the job so easy! To trim the vertical panel, I ripped the panel down to 12″. I LOVE the laser on the Ryobi saw! It made the job so easy! 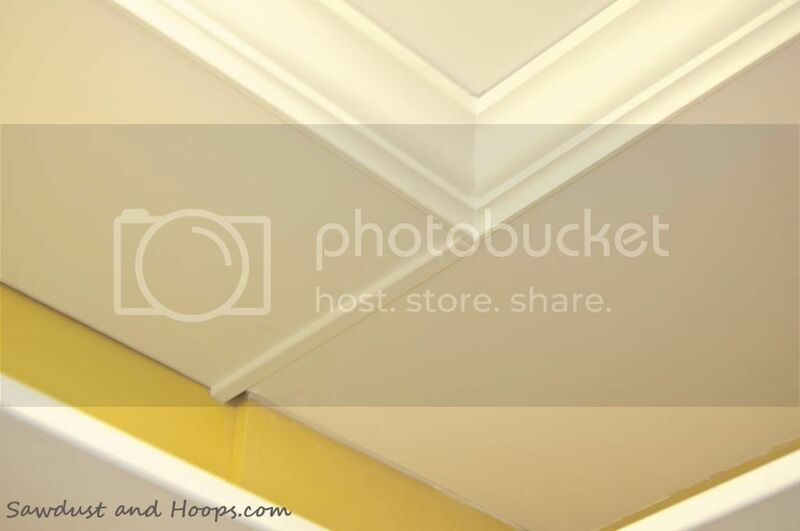 In the next photo, you can see the gap at the ceiling. 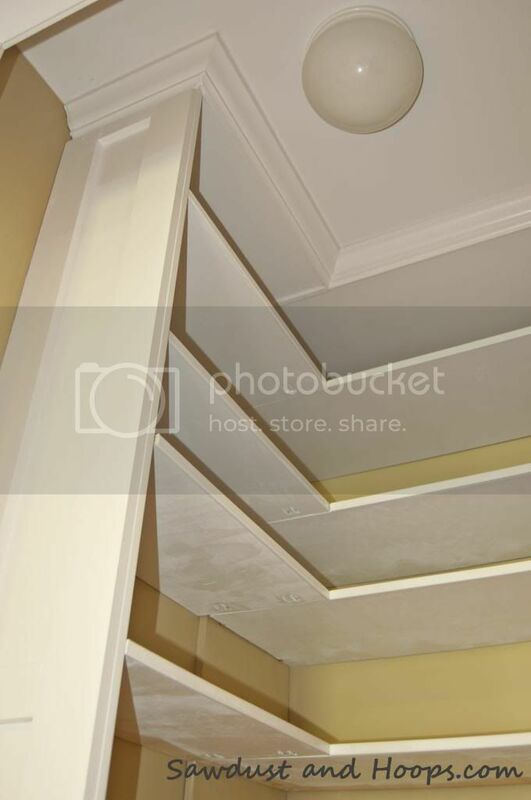 I wanted to put crown molding at the top and wanted to have the “ceiling” of the built-in at the bottom of the crown molding. Much better! Left panel is now 12″ deep. Back panel is 16″ deep. To join the fixed joints, I used the Kreg Jig Jr. If you are not familiar with the Kreg Jig Jr, it’s VERY easy to use and eliminates the need to use (and see) cleats! The instructions included with the Kreg Jig Jr are very detailed. If you are using the Kreg Jig Jr for the first time, do a dry run using scrap wood first and you should be good to go! The only issue I had with the Kreg Jig Jr was when I tried to use the peg hole fillers. The screws and the jig kit are great! 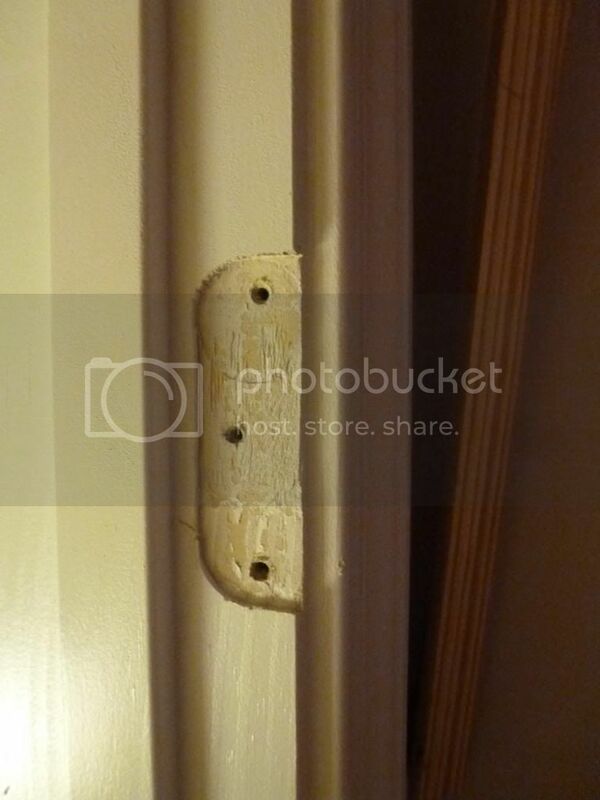 The problem I had was the peg hole fillers don’t fit the drilled hole and were ….well. a pain. I ended up chiseling them out and filling the holes with wood filler. It was easier and resulted in a cleaner look than the pegs. 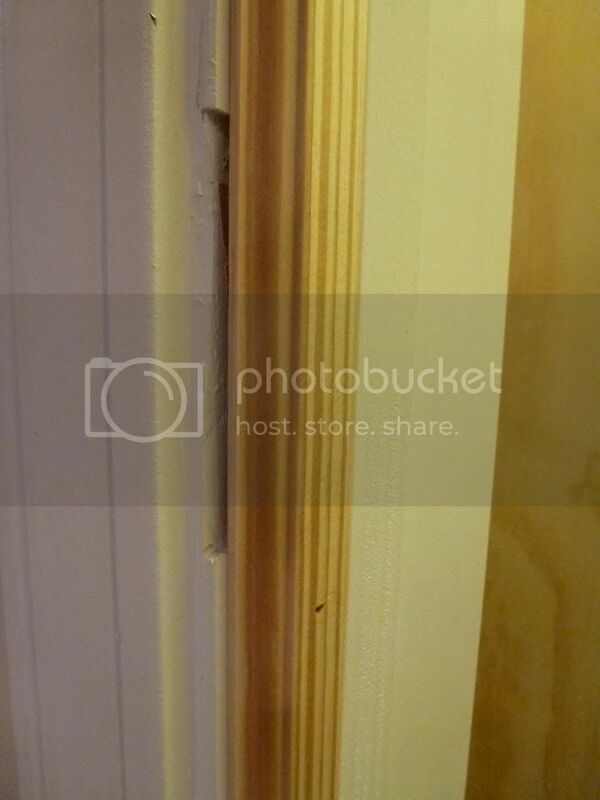 Fixed joints using the Kreg Jig Jr.
What do with that Door Frame! Since I couldn’t have a solid door on the closet, I wanted some flexibility in the future in case I ever did want to install an interior louvered door. In the meantime, I didn’t want to see the old hardware. So, off with the hardware! I covered the gaps with new trim and filled the remaining gaps with paintable caulk. The trim is removable if I change my mind later. 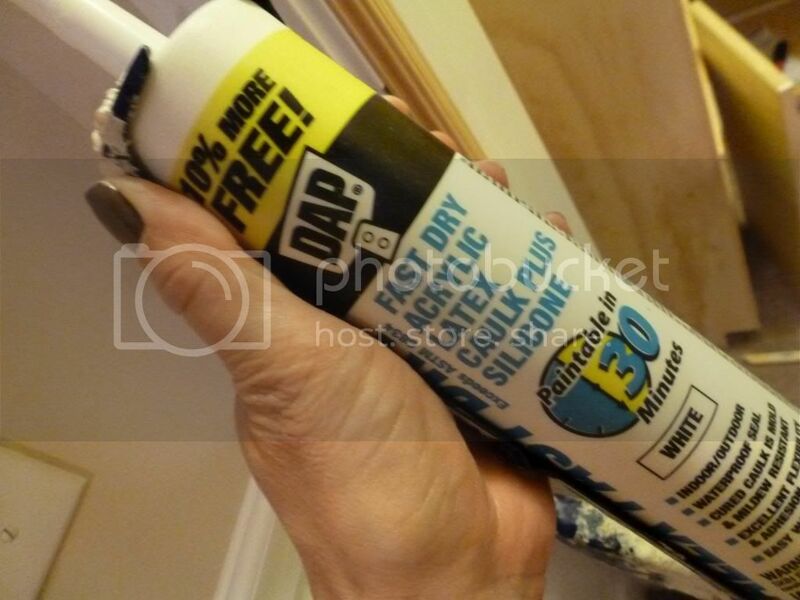 A little caulk covers the remaining gaps! 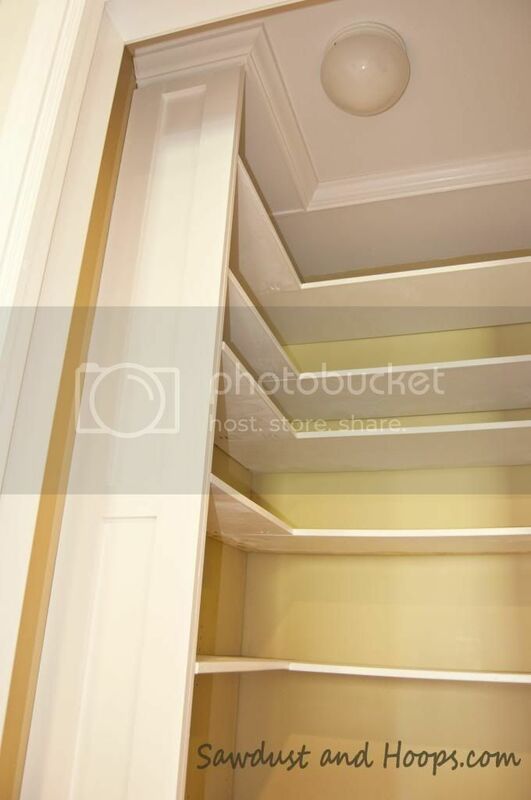 I designed this closet to have L-shaped shelves. I didn’t want to use a solid sheet of plywood for the shelves since it would produce too much waste after cutting. So, i cut the shelves for the back and for the side and joined them at an L using the Kreg Jig Jr as I did above. I love flexibility in closets! 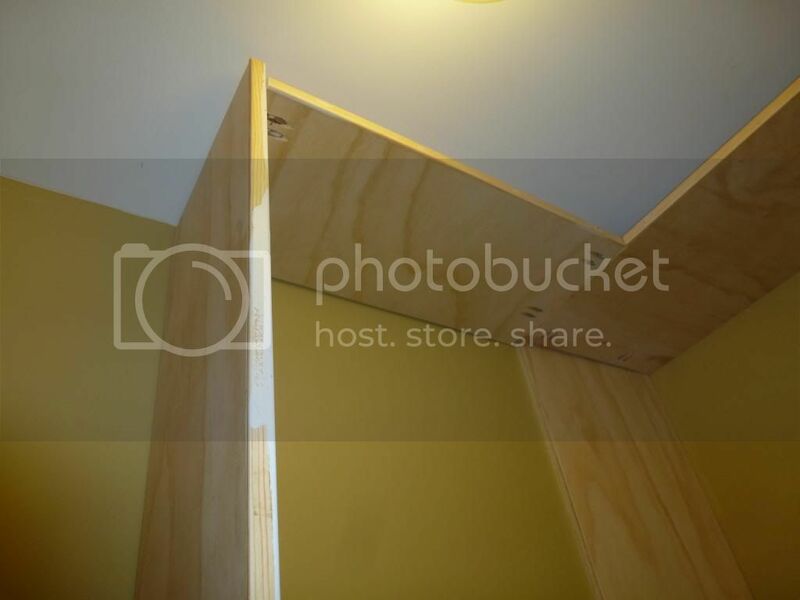 To make the shelves adjustable, I used the Kreg Shelf Pin Jig. This was my first project using the Kreg Shelf Pin Jig. Once I got a rhythm going, I found it easy to use. I finished the top off with crown molding and added 1×3 trim to the end panel to “dress it up”. After filtering out what to keep-toss-donate, I loaded it back up. 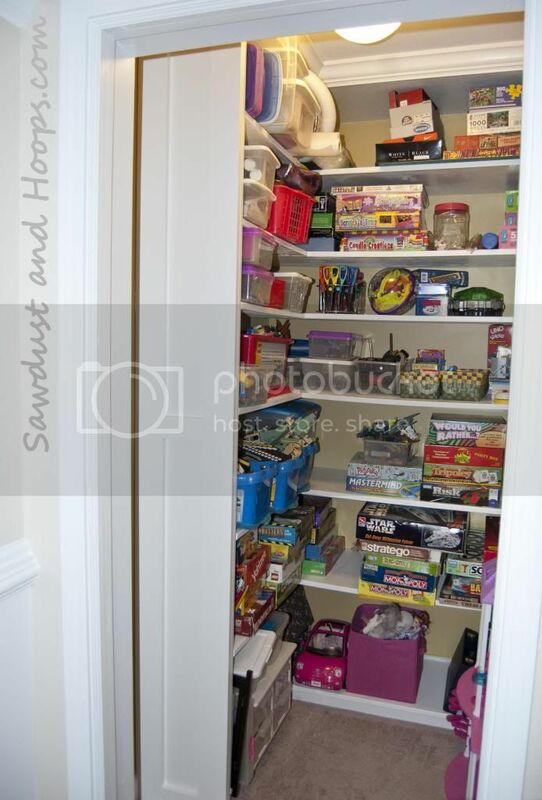 I was also able to filter through my son and step-daughters closets and add more to this Game Room Closet! I painted the HVAC vent to help it “disappear”. I may add art work to the side wall, but other than that, it’s DONE! FINALLY! 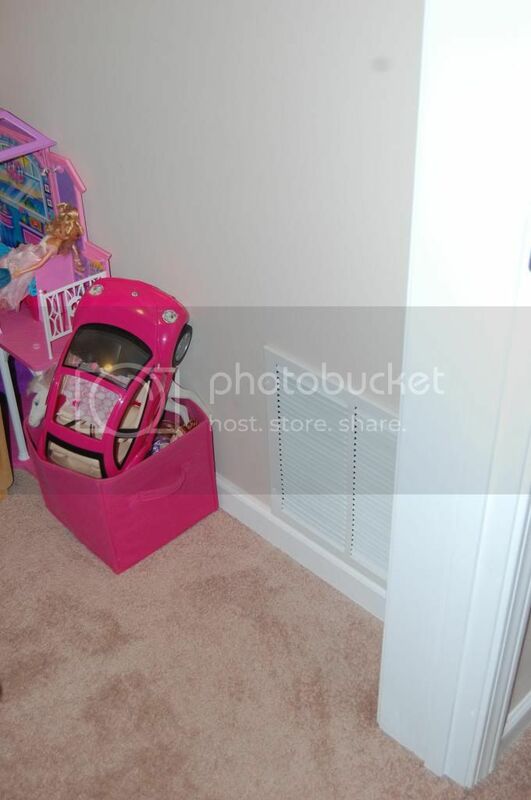 This project added so much square footage to the closet! And I LOVE how the crown molding and side panel trim and the kick-plate add a polished look to the closet! It’s no longer a sad eyesore! I’m working on the design for my next project, so stay tuned! This was not a sponsored post. I just want to mention that I did receive the Kreg Jig Jr as a “take-away” from the Haven Conference (an awesome bloggers conference held in Atlanta) in 2012. I also received the Kreg Shelf Pin Jig from the Haven Conference in 2013. They are great products and I recommend them ….well, except for the peg holes that can be used with the Kreg Jig Jr. Those could be designed better, in my opinion. * This post first appeared my now defunct blog Sawdust and Hoops. Hope you enjoyed the recap! Well, I am very guilty of not blogging lately. Life has changed a lot over the past two years. Due to the much higher hosting cost of my other blog, I'll only be posting to this blog moving forward. I'll be moving the posts from my old blog (Sawdust and Hoops) to here to get it catch up. Hope you enjoy the recap!!! 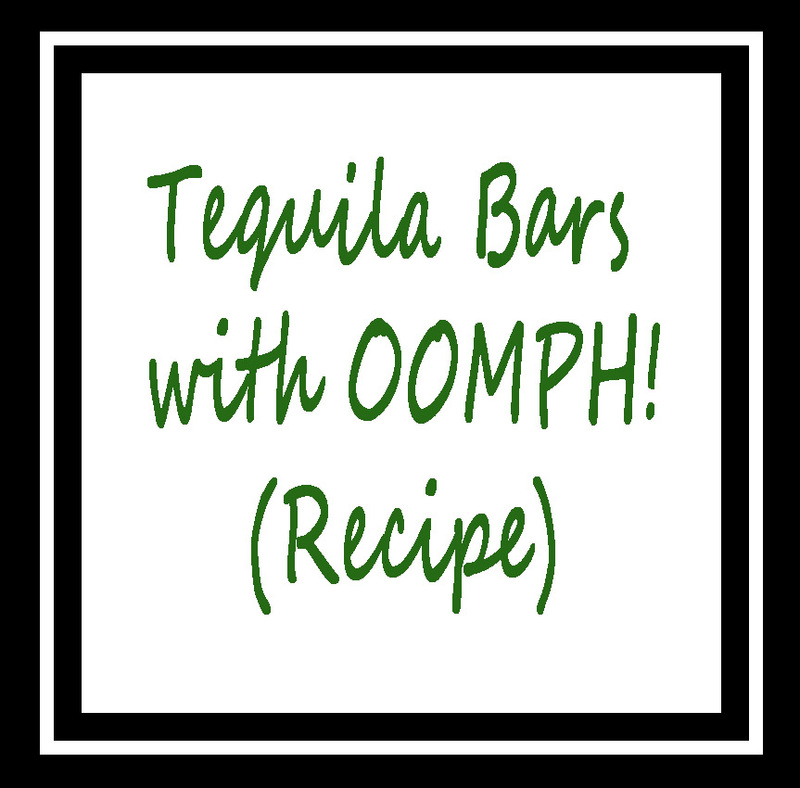 Margarita Dessert Bars (or Tequila Dessert Bars) are a fun and delicious take-a-long adult dessert. I have made the bars for a football party and a concert tailgating party! It tastes like a little margarita and were a hit! Follow the recipe as in the original recipe from Food Network with these updated ingredients. When preparing the drizzle, mix 2 parts Patron Gold and 1 part Agave Nectar. 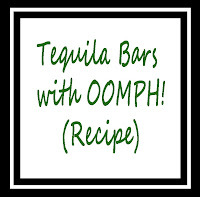 Apply the drizzle to the Tequila bars just before serving. A fun way to present the Margarita Dessert Bars and clue in other party-goers is to place a miniature empty bottle of Patron in the center of the plate and place the cut Margarita Dessert Bars around the bottle. Tastes like a margarita! Delicious way to celebrate with friends! I found an AWESOME find in the parking lot after dinner tonight and had to share! 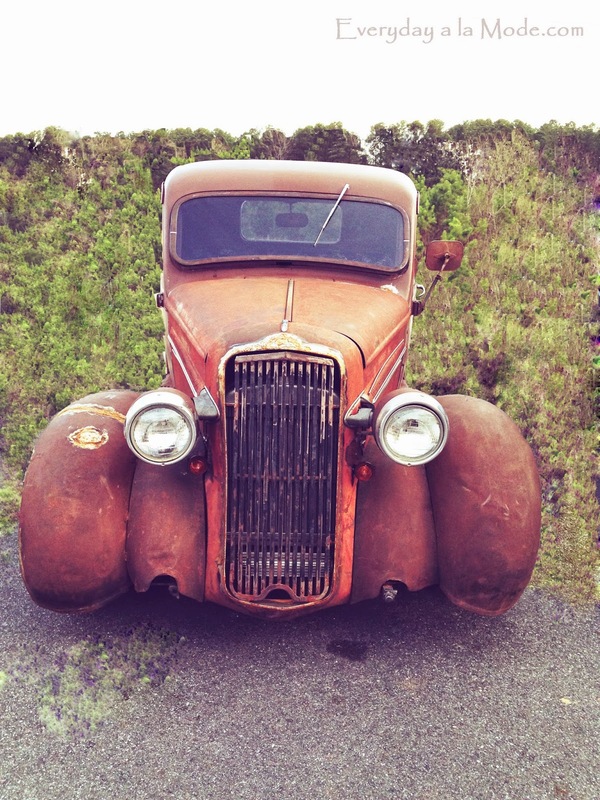 How often do you come across a classic car like this! Okay, I admit that wasn't how I found it. Unfortunately, reality doesn't always provide a great backdrop. Instead, there may be construction, wires, and distractions. Here is the original untouched photo. I could not resist grabbing my camera though and running into the street! 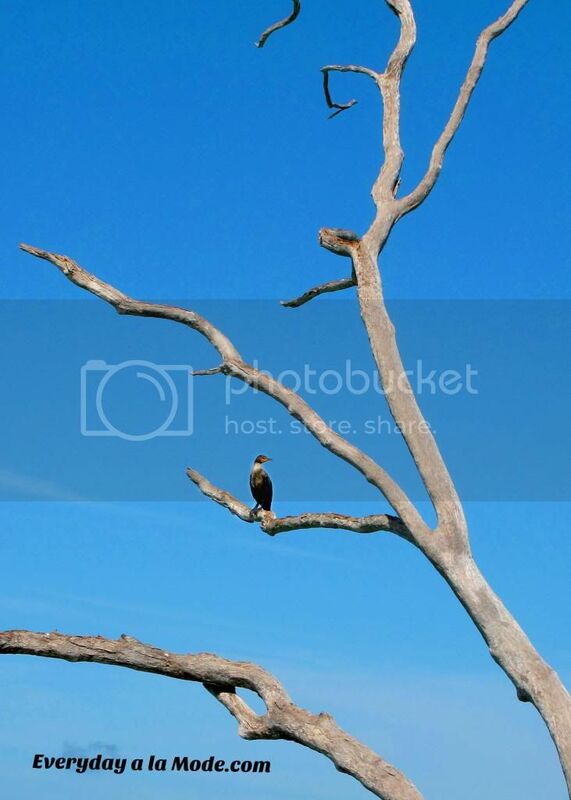 What a difference a few minutes on Photoshop will do! 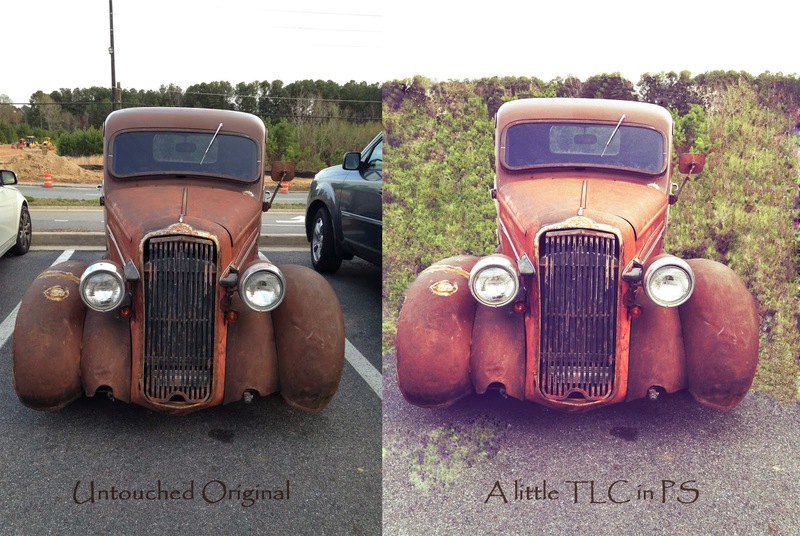 A little TLC makes all the difference! 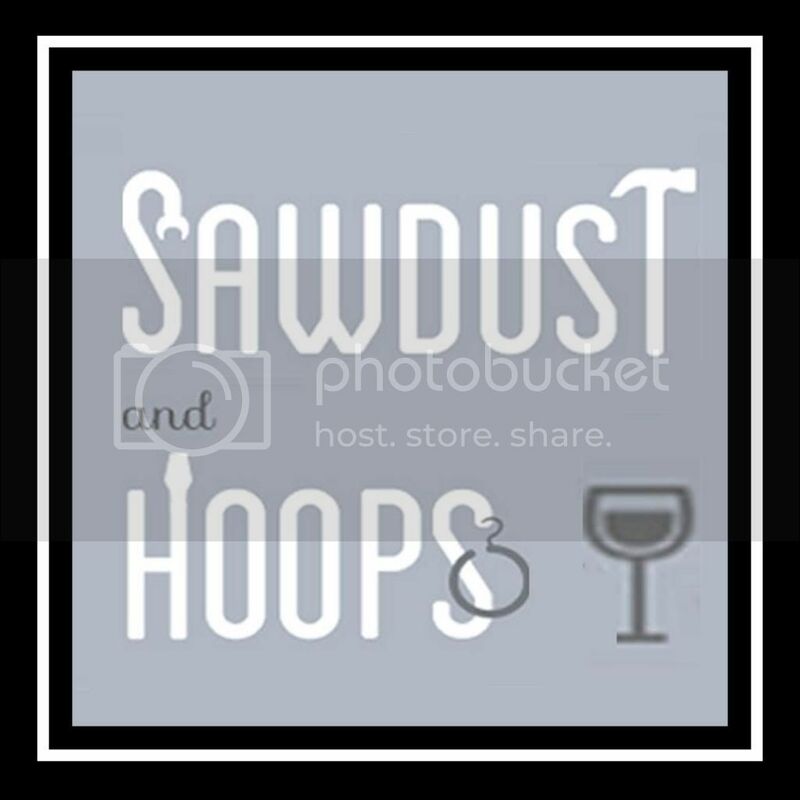 Please swing by and check out my new site Sawdust and Hoops, if you haven't already! It's a young blog, but with Spring arriving, I plan to have A LOT to blog about very soon! Hey everyone! I have launched my sister blog Sawdust and Hoops ! Everyday a la Mode is my first blog (launched back in 2011). Over 18 months, Everyday a la Mode has primarily evolved into a Photography, DIY, and Organizing blog with additional topics thrown in, like recipes and music. I felt those topics were becoming too diverse to be on the same site, so I decided to launch Sawdust and Hoops. Sawdust and Hoops will focus on DIY, home improvement projects, and organization. Moving forward, Everyday a la Mode will focus on photography, travel, music, recipes, or just me rambling on about something. Through Everyday a la Mode AND Sawdust and Hoops, I will share what inspires me and hopefully will inspire others. 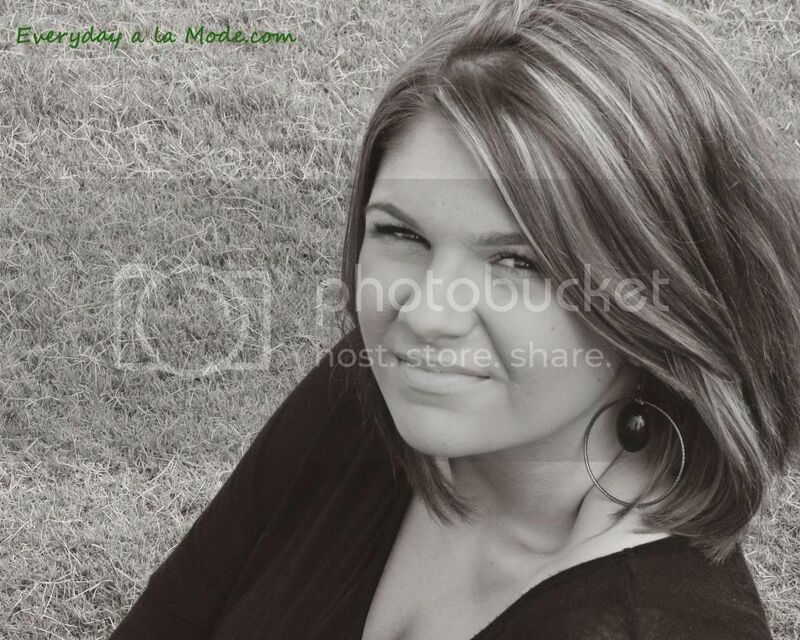 Meet my beautiful model this week! 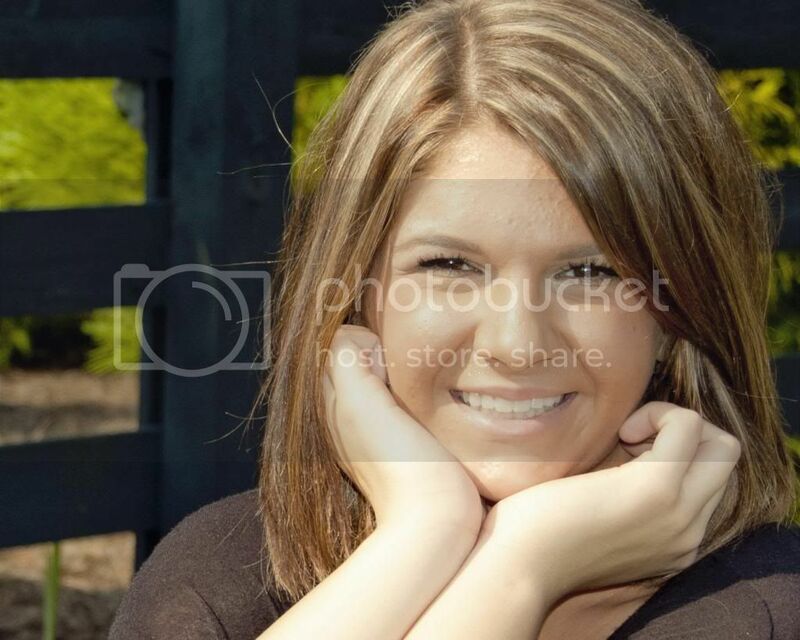 Seventeen year old Devin is entering her freshman year in college this Fall. 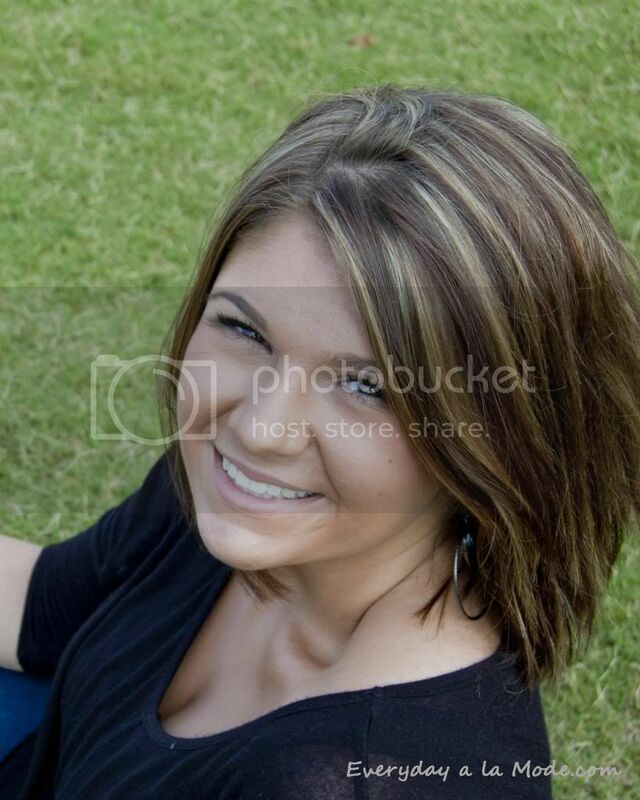 She needed a couple of head shots for school activities. I offered her a full shoot instead! 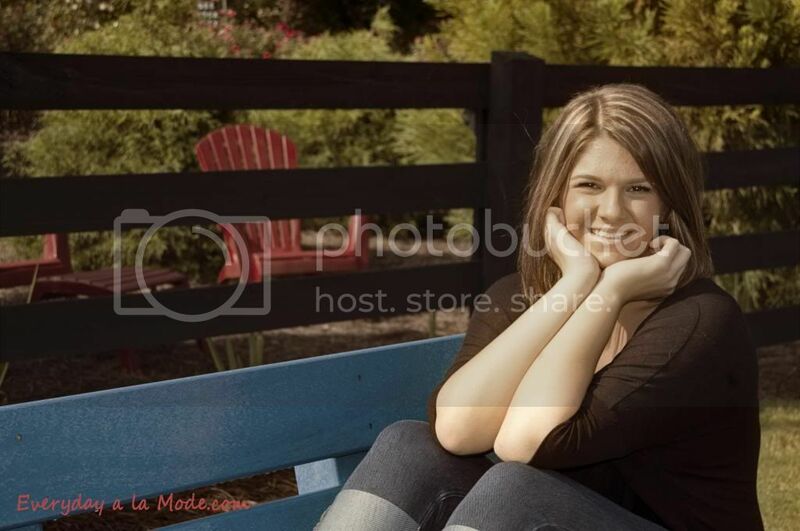 This next photo is so radiant and fun. I love it! The grass was wet with the morning dew, so I put towels on the grass and tucked them under so they are not in sight. 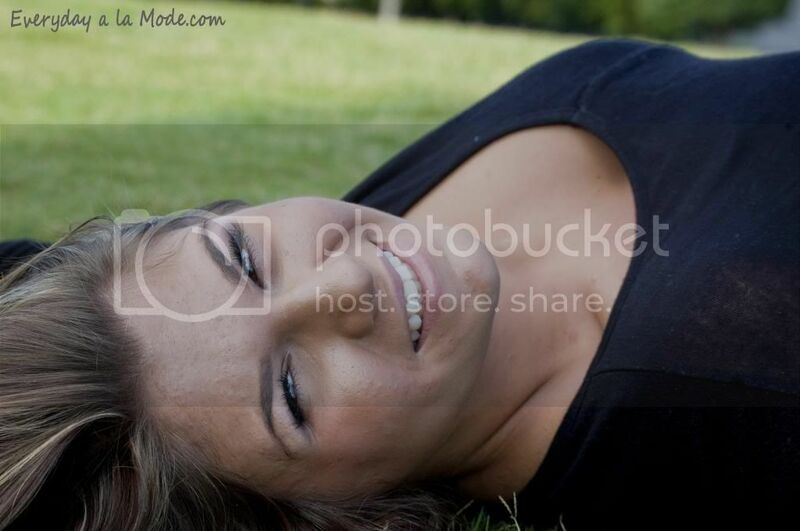 I had a mixed feelings about the next photo. I was almost deleted it. After converting it to black and white though, the photo conveys a air of peace and contemplation. Thank you Devin! It was great meeting you! 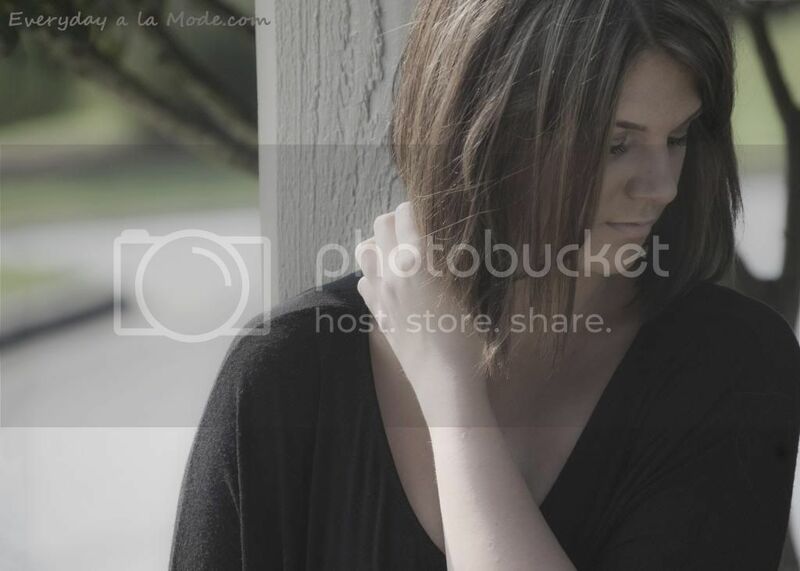 Beautiful shots! Good luck at college! 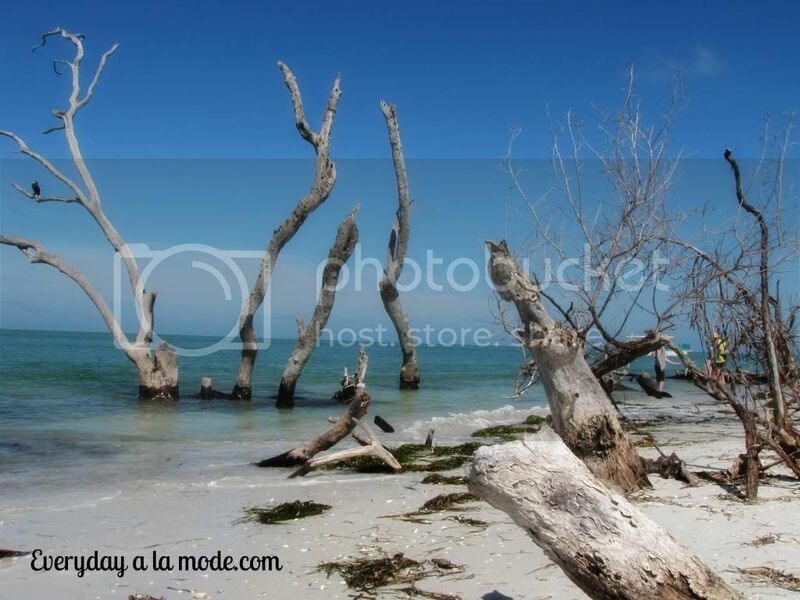 While vacationing in Sanibel, Fl last month, I wanted to take advantage of the calm before the daily afternoon storm. 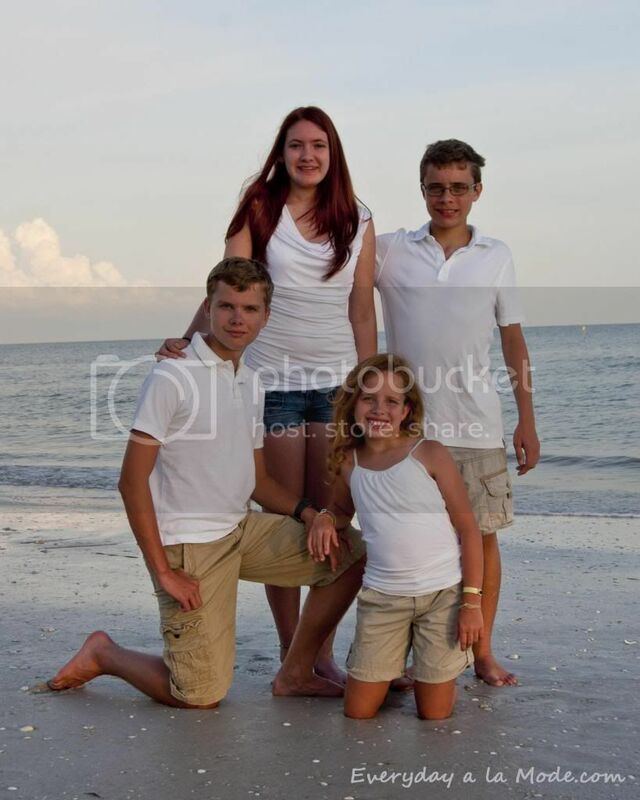 I forced the kids out of the water and into clean clothes for a few moments. 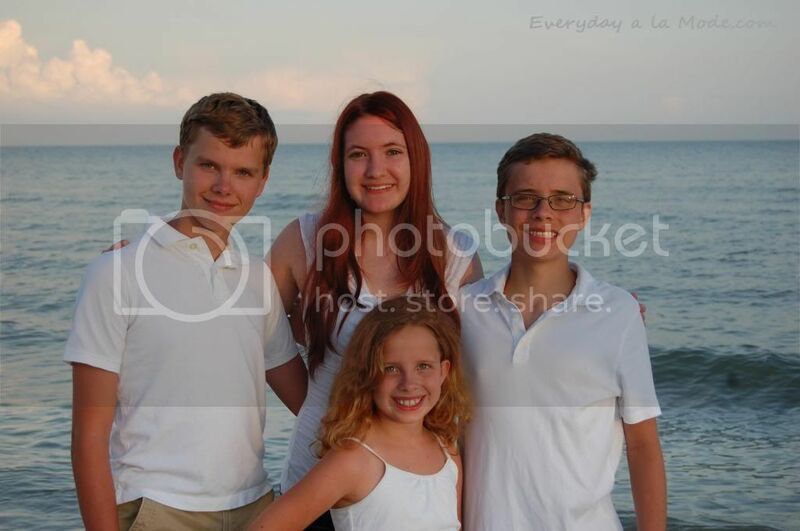 Coordinating four kids (16, 15, 14, and 11 years old) to not blink, squint, lean, poke each other, giggle, on and on and on..... wow, only a miracle can allow all of that not to happen. With the sun setting, I waited for a cloud to filter the light. I had them face towards the sun to reduce shadows on their faces. I have decided to launch a new blog! I attended the Haven conference last week in Atlanta and was inspired to expand the Everyday a la Mode blog idea. I will be launching a new blog that ....well, has a lot to do with power tools, carpentry, and larger DIY projects! I have several more ideas that I'm eager to share (more on those later)! I am 99% sure I have decided on the new blog name (I will announce that after I allocate the domain. It's fun though!). Another big change is that I will use Wordpress in the new blog. I currently use Blogger, so I am in the process of researching how to do the transition. I will keep Everyday a la Mode up throughout this transition. It will continue to feature photography, recipes, travel, and other inspirations. I hope you'll enjoy the changes! I will let you know when the new site is up and running!